As I’m building my own IQ house control system, I need to have RTC in my system. So started playing with MCP7940N and i2c interface. I’m using Raspberry Pi for my experiments with i2c/SPI. 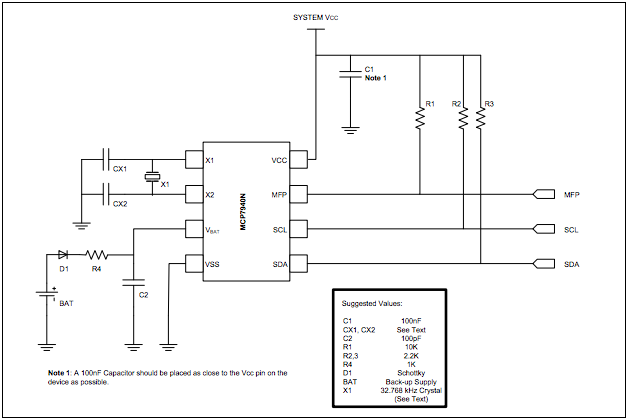 Construction is pretty simple, just use MCP7840N Datasheet. Then you can start checking with Pi. In my case, I’m using RevB, so my bus has number 1 and RTC got 0x6f address. Fine. But if we’re setting ’00’ as seconds – address 0x00 – why value 0x80? 7th bit = ST – onboard oscilator enabled. It seems like there is no connection at all with the RTC. Am I missing something? The setup script creates /dev/i2c-1, but there is no communication using i2c tools. Did you use some setup besides the official script? Any other configuration/module? which RasPi revision do you have? I have a model B.
I will try a clean installation and your steps and let you know what happens. /run/udev or .udevdb or .udev presence implies active udev. Aborting MAKEDEV invocation. I don’t know what this means, but it seems to be the source of my problems. Wierd, it is a clean raspbian installation.